Drawing on personal experience Independent Community Activist Cathal McCarthy opens a window into how Sinn Fein goes about its business. For many of Sinn Féin’s opponents the issue of whether or not Gerry Adams used to be a member of the IRA seems to be their biggest problem with the party. For me however, Adam’s alleged IRA membership is an irrelevant subject; the IRA is no longer at war, they have verifiably decommissioned their weapons and the Peace Process has transformed life in the North. I believe Adams when he says he was never a member, although I think that it more a case that he was never sworn in as opposed to having no influence over their actions. I am more concerned with the way Sinn Féin operates. From 1993 – 2010 I was a member of the National Executive of the Irish National Congress (INC) and during that time I had a lot of direct dealings with Sinn Féin. 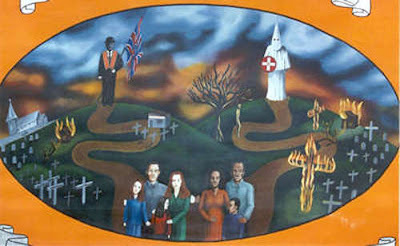 The INC was a lobby group that promoted constitutional republicanism through the ideals of “freedom, unity and peace”. 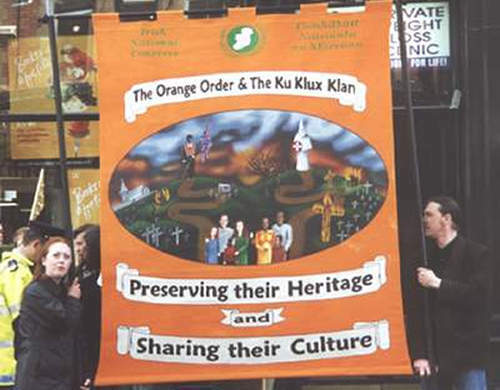 Phoenix Magazine once described the INC as an organisation for “middle-class republicans that baulked at the idea of joining Sinn Féin”, but nothing could be further from the truth. 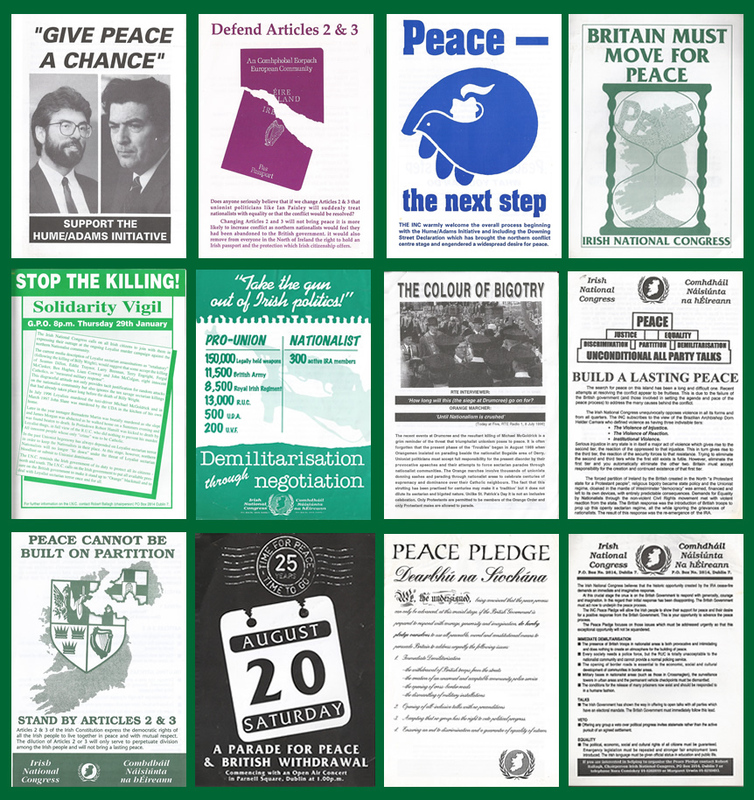 The INC was a liberating space where republicans from all parties came together to discuss our differences and agree a strategy to end political violence and partition. We even had members of Fine Gael involved, until they were whipped out by their party. The INC was a key player in a number of high-profile campaigns such as Repeal Section 31 (the Ministerial that had banned Sinn Féin from Irish radio and television since 1972), the campaign to reopen Border Roads destroyed by the British Army, the Give Peace A Chance campaign, the campaign to Defend Articles 2 & 3 and the Time For Peace- Time To Go campaign. At the time, Fine Gael was in government and the Taoiseach, John Bruton, wanted to delete Article 2 & 3 form our Constitution to appease northern Unionists. Our campaign ensured that public opinion was against holding a referendum, which was just as well because amending Articles 2 & 3 would later become central to negotiating the Good Friday Agreement with the INC, not Sinn Féin, negotiating the amended wording with the Fianna Fáil government. In the late ‘90’s the wife and I used to go holidays every August to West-Belfast for the week long festivities of Féile an Phobail. The festival always ended with the annual anti-internment commemoration rally and in 1999 our participation in this event made the front page of the Sinn Féin newspaper, An Phoblacht/Republican News. I didn’t realise it at the time, but this was to be the beginning of a love-bombing campaign to get me to join Sinn Féin. It was suggested to me on numerous occasions by a variety of their members that I should consider joining the party, that I would be a great asset. The ego massaging switched to outright bribery in 2000 when I “won” a weekend away to Glasgow to see Celtic play. I had witnessed the draw being rigged and I was taken aback when I was the “winner”. For fun I refused to accept the prize unless it was changed to a trip for two so that I could take my wife. That would be no problem I was told, all I had to do in order to collect my greatly-increased prize was to join Sinn Féin! In 2000 I was Vice-Chair and PRO of the INC, Mary Lou McDonald (then a member of Fianna Fáil) was the INC’s Chairperson. Mary Lou and I were invited to attend a meeting with Sinn Féin party officials to try and dissuade the INC from holding a protest against the civic endorsement of Orange Order sectarianism by Dublin City Council. Sinn Féin was of the opinion that the Celtic Supporters Club intended to disrupt proceedings and that the ensuing violence would reflect badly on any organisation that was there to engage in peaceful protest. The INC was of the opinion that this was merely speculation and that any violence, if it occurred, would be publically condemned by us. We informed Sinn Féin that we would be going ahead with the protest. It was after this meeting that I was contacted separately and invited to join Sinn Féin. I was offered IR£35,000 (we still had the punt) per annum to become a Sinn Féin activist and organiser in Limerick City. I refused the offer. I had come to the conclusion the previous year that Sinn Féin’s Ard Chomhairle (their ruling body) was not so much Republican and Nationalist as it was Marxist and Communist. More importantly, I am Pro-Life and Sinn Féin are pro-abortion-on-demand, so even if they doubled the money on offer I was never going to join. I rang Mary Lou to tell her of this development and she informed me that the same offer had been made to her and that she had accepted it; she asked me not to tell the other members of the INC National Executive, as her membership would not become official for another 3-months and that she would announce it then (normally there is a 6-month “vetting” period, but Mary Lou’s membership was being fast-tracked). Less than a week before the protest I got a panicked phone call from the INC’s Secretary, Sile Carson, informing me that a majority of the INC's National Executive were now opposed to holding the protest, that Mary Lou had been ringing around and convincing people that it was a bad idea. I assured Síle that the protest would go ahead as had been unanimously agreed at our last meeting, even if it was just the two of us; members were free not to participate, but any decision to call-off the protest would require another meeting and another vote. I did my own ring around and convinced everyone to take part. Of course I felt I had no option but reveal Mary Lou’s membership of Sinn Féin to the other members. 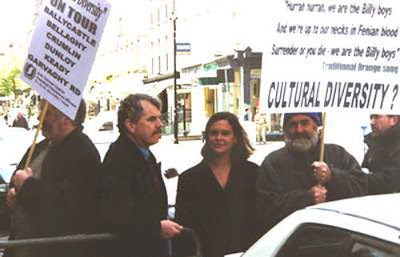 I presented Mary Lou with two options, either resign as Chairperson or lead us in protest – she chose the latter and in Dawson St., Dublin on 28 May 2000, Mary Lou made her national and international television debut. In terms of publicity, it was most successful protest that the INC had ever mounted. Cindy and I had painted a mock Orange banner, which stole the show. As we turned the corner onto Dawson Street the media stampeded towards us. Mary Lou resigned from the INC shortly after that but she kept in contact; she had been parachuted into the Joe McDonnell Cumann by the Ard Chomhairle as their candidate in the 2002 general election and she was terrified. The Cumann had already selected their candidate and they were not exactly happy about having their decision over-ruled. As a means to break the ice, Cindy and I agreed to make a banner for the Cumann for Mary Lou to present to them as a gift and Sinn Féin compensated the selected candidate will an all-expenses-paid two-week holiday in Spain. When I refused to help her Cumann with an anti-bin charges campaign they were mounting, because I wasn't a member and it felt like I was been dragged in and because I had other things to be doing, I explained my reasons and I never heard from Mary Lou again. In 2002 I was Chairperson of the INC when I received a letter from Finian McGrath asking me to use any influence I had with Sinn Féin to stop them from fielding a candidate in his constituency as he believed that this would split the republican vote and allow a “two-nationist” Labour candidate to win. Finian was a Dublin City Councillor and former Vice-Chair of the INC; he was contesting the 2002 general election and felt he had a good chance of taking the last seat. Finian told me that he had been invited to join Sinn Féin and run as their candidate and when he refused they told him that they would run a candidate against him and destroy his chances of becoming a TD. I explained to Finian that I had absolutely no influence with Sinn Féin and I suggested that he should contact Mary Lou; he told me that he had left several messages for her, but she hadn’t returned his calls. Sinn Féin ran a candidate against Finian; he polled just over 800 first preference votes and when he was eliminated most of his transfers went to Fine Gael! Clearly there had also been a whispering campaign against Finian, but despite this he still took the last seat and he has kept it since. I wish him every success this time round. 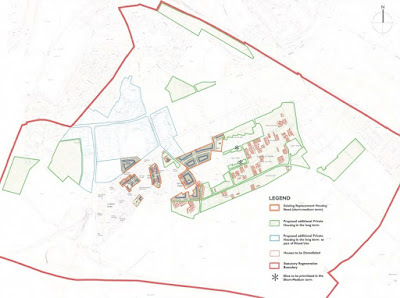 In 2007 I was trying to find out what “regeneration” might mean for Limerick, so I contacted a Sinn Féin Councillor in one of Dublin’s “regeneration” areas. I also made contact with several residents’ groups. 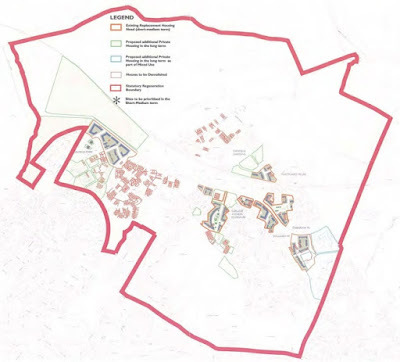 I had several conversations with the Councillor and he gave me some solid advice regarding the sort things to watch out for, such as poor consultation and sub-standard housing sizes in the new houses. During one of our chats I informed that some of the resident’s I spoke to were less than impressed with him as a Councillor; his response was very enlightening. He told me that he used to be an Independent but that he had been requited by Sinn Féin with the same offer that was made to me in 2000. He said that he has to send the agenda for every Council to “Head Office” and that they send him back a list of things to say on every issue. He told me that he regretted joining, but that he was dependent on the wages and if he left he could never make as much as an Independent Councillor. It would appear to me that Sinn Féin is, like most political parties, very much a top-down organisation with a bottom-up veneer – the Ard Chomhairle calls the shots. Whether standing up, sitting down or lying on the flat of his back, I don’t care what position the Sinn Féin candidate for Limerick City takes as long as he is willing and able to speak out and act in the best interests of the communities he seeks to represent. Unfortunately, when it comes to Limericks “regeneration” communities, speaking out and acting in our best interests is something that Quinlivan has failed to do as a City Councillor and I can’t see that changing when he becomes a TD. In February 2014, Quinlivan voted (along with the rest of the noddies - it was a unanimous vote) to approve the Limerick Regeneration Framework Implementation Plan (LRFIP). 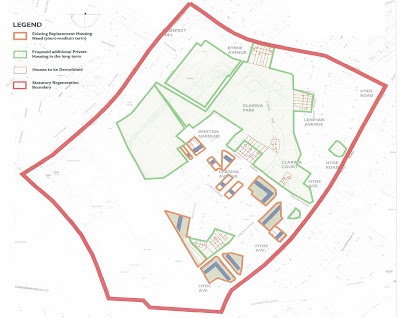 This plan green-lined much of the land for private development in the long-term and red-limed many occupied homes for demolition without the agreement of the residents. Prior to this vote all of the City Councillors had been emailed with a submission from residents groups in Ballinacurra Weston that highlighted the many problems with the LRFIP like the lack of proper consultation and real participation of residents in developing the plans, and pointed out issues that were not addressed, such as the CCTV cameras being unmonitored. And in case they had forgotten, a letter of support for the submission from Special Rapporteur to the United Nations Human Rights Council was left on their desks before the vote took place. 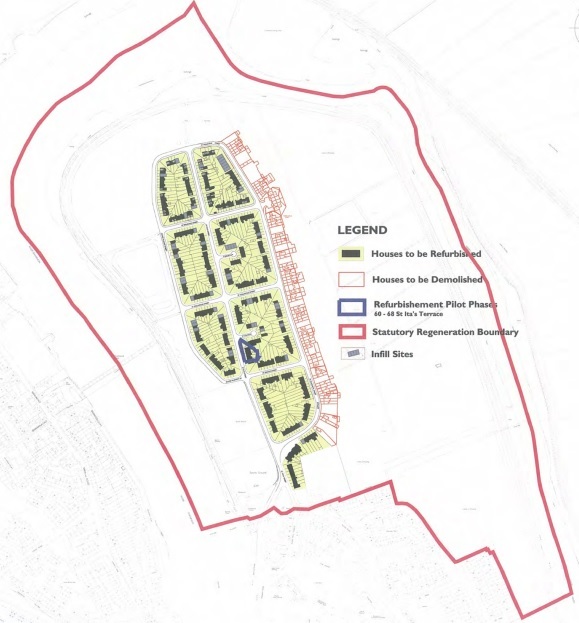 It is really hard to take the Sinn Féin rhetoric about social and affordable housing seriously when a plan like this can go unchallenged by their representative. Pointing at boarded-up houses in photographs and decrying “regeneration” to the media is great for creating a perception in the public mind that a politician is on their side, but people need to look more closely at what they could have done and said when it really mattered. 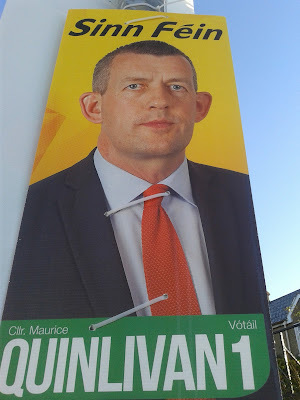 Even if Quinlivan had been the only Councillor to speak out against the fantasy that is the LRFIP, it would have at least have made those issues a matter of public record, and who knows, maybe if he hadn't stayed silent, enough of the other Councillors might have been embarrassed into voting against it. The idea that a proposal to demolish peoples homes without agreement or even informing the residents can be made is simply reprehensible and the fact that none of our Councillors spoke against it is abhorrent. 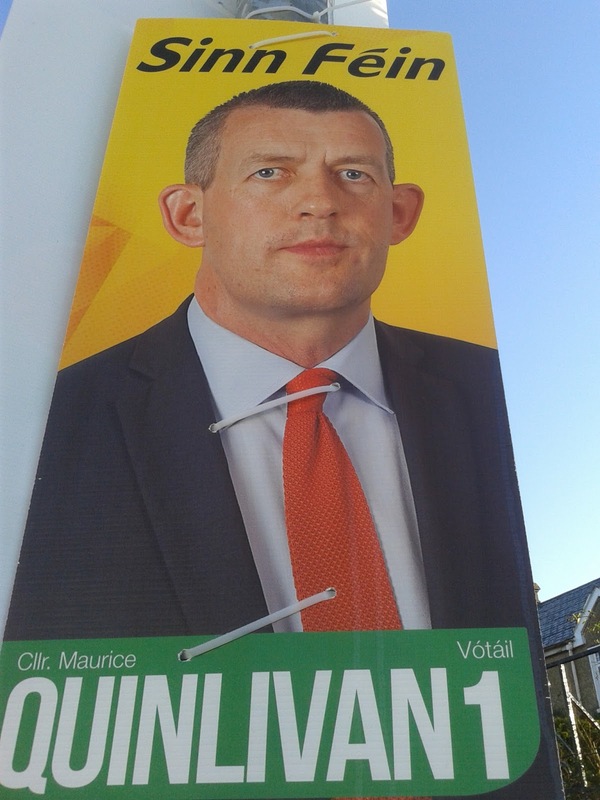 Even though he chose to remain mute, I have no doubt that Quinlivan will take a seat, possibly the third seat, maybe even the second. In 1918 when the original Sinn Féin won 73 out of the 105 seats for Ireland in Westminster on the basis that they would not take their seats and instead form a a parliament of our own, it was remarked by one commentator that Sinn Féin could stand a donkey forward and it would be elected. That looks to be the case again for this election. Well I haven't been fooled and Quinlivan's inaction has earned him my No. 11 vote and in case you think that's a type-o I'll spell it out for you – number eleven!! Excellent article. I wouldn't agree with prolife but that does not stop me from admiring your stance and this history of your personal experiences. Well written, clear and in my experience totally valid. Mary Lou caught in the trap. You're free to disagree, but I wouldn't have been if I joined. Mary Lou would still be in Fianna Fáil if they had recognised her potential; she's a career politician. A great article especially since it gives an insight into the wheeling and dealing of Sinn Fein. However, to say that SF is pro-abortion is utterly rubbish. If I remember correctly Daisy Miles, Sinn Fein member of the then Sinn Fein Women’s department, presented an extremely watered down motion of a “women’s right to choice” to their Ard Fheis in the mid 1990s. The motion was passed but only because it was the last motion on the agenda and most of all delegates had gone home. However, a few days later it was dismissed by Gerry Adams as being too diversive and did not become Sinn Fein policy. Sinn Fein is a party that may gain political power in the Southern election but is also without principles, except one and that is to get into power at all costs. Just to say a person is pro-choice should not imply they are pro-abortion. Please note the word “choice” in this sentence. fair play to you, shows exactly what a north korean bunch of slobs and sycophants sf now are. absolutely hit the nail on the head when u call them marxist. fair play to u for sticking up for the unborn child. bobby ballagh contribution to 75th anniversary was mighty. happy memories of being a young republican back then. not like now - i just discovered another article here on TPQ about where the profits from the writings of bobby sands goes. 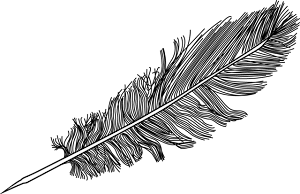 that to me is the straw that has broke the camels back, and i for one apologise now for any abuse i gave to the stickies (the very few i knew) back in the day. u were honourable men compared to the toxic marxists, gender benders, abortionists, gaylords, diesel launderers, south armagh bandits, and all round lying cunts who took over the movement. One could convincingly make the case for the Shinners leadership being the bourgeoisie and the 'grass roots' republicans to be the proletariat, especially in light of the co-opting of funds from the Bobby Sands trust, the blind eye turned to former prisoners being paid pittance on building sites, the well paid jobs in suits as 'special advisors' et cetera. Marxist is pretty feckin far from a moniker I would use for Sinn Fein. The Stickies WERE professed Marxists by the way.